Father Figure is a FREE download for the next 5 days from 2/16 thru 2/20. Help yourselves! Thank you so much for your support in sharing, downloading, reading, and reviewing. I appreciate it! Between the fast-paced New York City, a rural Mississippi town and a charming Pennsylvania college campus filled with secrets, two young girls learn the consequences of growing up too quickly. Amalia Graeme, abused by her mother for most of her life, longs to escape her desolate hometown and fall in love. Contemplating her loss of innocence and conflicting feelings between her boyfriend and the dangerous attraction she’s developed for an older man, Amalia faces life-altering tragedies. Brianna Porter, a sassy, angst-ridden teenager raised in New York City, yearns to find her life’s true purpose, conquer her fear of abandonment, and interpret an intimidating desire for her best friend, Shanelle. Desperate to find the father whom her mother refuses to reveal, Brianna accidentally finds out a shocking truth about her missing parent. Set in alternating chapters two decades apart, the parallels between their lives and the unavoidable collision that is bound to happen is revealed. FATHER FIGURE is an emotional story filled with mystery, romance, and suspense. This entry was posted in Father Figure, My Blog, My Writing and tagged abuse, creativia, Family Drama, Father Figure, mystery, new adult, parenting, relationships, young adult. Not only did I release the 2nd book in the Braxton Campus mystery series — ‘Broken Heart Attack‘ — for pre-sale this week, but ‘Father Figure’ is a free download thru 11/21. Please SHARE… thanks. Download 3 of My Books For FREE This Month! on various dates through November. Happy Early Thanksgiving! Description: When Kellan Ayrwick, a thirty-two-year-old single father, is forced to return home for his father’s retirement from Braxton College, he finds the dead body of a professor in Diamond Hall’s stairwell. Unfortunately, Kellan has a connection to the victim, and so do several members of his family. Could one of them be guilty of murder? Then he finds a second body after discovering mysterious donations to the college’s athletic program, a nasty blog denouncing his father, and a criminal attempting to change student grades so the star baseball pitcher isn’t expelled. Someone is playing games on campus, but none of the facts add up. With the help of his eccentric and trouble-making nana weeding through the clues, Kellan tries to stay out of the sheriff’s way. Fate has other plans. Kellan is close to discovering the killer’s identity just as someone he loves is put in grave danger of becoming victim number three. And if that’s not enough to wreak havoc on his family, everything comes crashing to a halt when his own past comes spiraling back to change his life forever. In this debut novel in the Braxton Campus Mystery Series, readers discover a cozy, secluded Pennsylvania village full of quirky, sarcastic, and nosy residents. Among the daily workings of Braxton College and the charming Ayrwick family, Kellan weighs his investigative talents against an opportunity to achieve a much sought-after dream. When this first book ends, the drama is set for the next adventure in Kellan’s future… and it’s one you won’t want to miss. Description: The wealthy Glass family lost its patriarch, Benjamin Glass, sooner than expected. Benjamin’s widow, Olivia, and her 5 sons each react to his death in their own way while preparing for the reading of his will. Olivia receives a very unexpected confession from her late husband about one of their sons that could shatter the whole family. Prior to revealing the secret to her children, Olivia must figure out which boy Ben refers to in the confession he left her in his will. While the family attorney searches for the mysterious Rowena Hector whom Ben says holds the answers, Olivia asks her sons to each spend a week with her as she isn’t ready to let go of the past. When Olivia visits her sons, she quickly learns that each one has been keeping his own secret from her. Olivia never expected her remaining years would be so complex and life-altering, but she will not rest until her family is reunited after Ben’s untimely death. We all need family. We all want to fit in. We’re all a mix of quirky personalities. Will Olivia be able to fix them or will the whole family implode? What will she do when she discovers the son behind Ben’s secret? Check out this ensemble cast where each family member’s perspective is center stage, discovering along the way who might feel the biggest impact from all the secrets. Through various scenes and memories across a six-month period, you’ll get to know everyone, learning how and why they made certain decisions. Welcome to being an honorary member of the Glass family where the flair for over-the-top drama pushes everyone to their limits. Description: Between the fast-paced New York City, a rural Mississippi town, and a charming Pennsylvania college campus filled with secrets, two young girls learn the consequences of growing up too quickly. Struggling to survive in a claustrophobic, unforgiving world, they embark on a journey to overcome all the pain, disappointment, and horror of their experiences. Amalia Graeme, abused by her mother for most of her life, longs to escape her desolate hometown, connect with others, and fall in love. Contemplating an impending loss of innocence and conflicting feelings between her boyfriend and the dangerous attraction she’s developed for an older man, Amalia suffers devastating, life-altering tragedies. No matter where she turns, someone or something always steals her hope of finding happiness, protection, and love. Brianna Porter, a sassy yet angst-ridden teenager raised in New York City, yearns to determine her life’s true purpose, conquer her fear of abandonment, and interpret an intimidating desire for her best friend, Shanelle. All the confusion stems from desperately needing to find the father whom her mother refuses to reveal, but an unexpected discovery of a journal leads Brianna to a shocking revelation about her missing parent. Unfortunately, by casting the net to find him, she’s unleashed a tragic history that was meant to stay buried and might now completely change everyone’s futures. Through alternating chapters set two decades apart, each girl’s plight unfolds revealing the parallels between their lives and the subsequent collision that is bound to happen. In an emotional story filled with mystery, romance, and suspense, fate intervenes forcing someone to make a dreadful decision that will leave permanent scars. This entry was posted in College Campus Cozy Mystery, Father Figure, My Blog, My Writing, Watching a Glass Shatter and tagged academic curveball, books, creativiapub, Father Figure, fiction, free books, freebie, gratitude, mystery, thanksgiving, watching glass shatter. 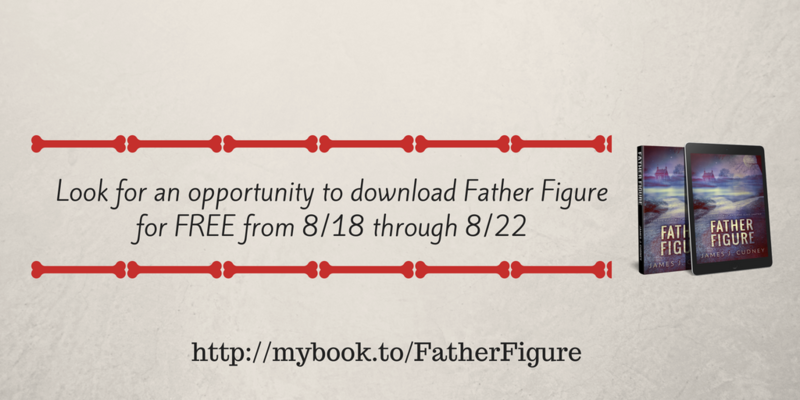 Today is the last day to download one of my novels, Father Figure, for FREE. You can download and read it via Amazon Kindle at this link. Earlier this week, I received a surprise package in the mail from someone I met just over a year ago. We chatted via our blogs, built a friendship, and then began referring to one another as ‘brother’ and ‘sister’ because of the many similarities (also several differences) and powerful connection in such a short time. We chat several times a day via texting or calls, swap pictures of life on the farm and life in NYC, and help each other push through the pain, sweat, and tears of all our creative work. What’s special about this woman is not only her amazing generosity and humble approach to life, but that she can tolerate me! After I finished my first novel, she sent me a painting of the book cover. It was fantastic, and I absolutely adore it. The painting hangs on the wall in the hallway leading from the living room to the bedroom alongside a framed actual book cover my parents gave me last year. You can see more via the post during my 365 Daily Challenge. Well… after I finished my second novel, Father Figure, the same artist, sister, and friend painted another cover. It’s stunning! I wanted to share it the last few days but I thought it was a perfect post for today as the promotion winds down. It is such an amazing and gorgeous match! To my wonderful and dearest friend, Roda @ GrowingSelf, thank you for being one of the most amazing things I found in the last year since going on this journey as a blogger and an author. For anyone who must check out more of her art — from bees to flowers to animals to so much more — view her art site here. Thank you, Big Sis. I love you! This entry was posted in Father Figure, My Blog, My Writing, Watching a Glass Shatter and tagged art, books, Father Figure, friendship, Growing Self, painting, sibling, watching glass shatter. This entry was posted in Father Figure, My Blog, My Writing and tagged book, bookworm, download, Father Figure, free, james cudney. Last week, my first novel, Watching Glass Shatter, was available for FREE download. This week, you can now download my second novel FATHER FIGURE for FREE via Amazon as a Kindle e-read from Saturday August 18th through Wednesday August 22nd. Set in alternating chapters two decades apart, the parallels between their lives and the subsequent collision that is bound to happen is revealed. FATHER FIGURE is an emotional story filled with mystery, romance, and suspense. This entry was posted in Father Figure, My Blog, My Writing and tagged #BackaBlogger, book, college, Family Drama, Father Figure, free book, freebie, giveaway, mystery, secerts, suspense. July 2018 – Author Newsletter & FREEBIE coming up! Hi. Today I emailed my quarterly author newsletter to everyone in my email distribution list. Below is a copy in case you are interested in reading. To subscribe, please go to my website. Thanks for reading and sharing with everyone. Have a great day. Watching Glass Shatter was offered as a FREE download for 5 days. In the first week after this promotion, book reviews on Amazon and Goodreads increased by 15% with multiple 5 and 4 star awards! Father Figure, my second novel, was launched with great success. It’s been available for 4 months and has been doing very well. Check out the blog tour and book blitz promotions. I committed to reading 104 books on my Goodreads 2018 Challenge. I finished in early August. Rather than increase it to 150, I’ll leave it as it stands, but that’s my new goal! How’d you do? Let’s talk about what’s coming up later this year! A 2019 sequel focusing on all the drama the Glass family encounters after Olivia revealed everyone’s secrets at the end of the first book. Savvy readers will remember she never actually told the truth of what was in the second letter, but rest assured, it’ll come full circle again. A short story collection is in the works for 2018! Based on your input in the ‘Favorite Character’ poll, Ethan Glass will be the focus of the first short story, due out in October 2018. Kellan Ayrwick, a 32-year-old single father, moved to LA to escape his complicated but lovable family. When Kellan requests time off to attend a party for his father’s retirement from Braxton College, his boss assigns him to meet with Abby Monroe, a source for their upcoming tv series who happens to live nearby. Unfortunately, while Kellan’s socializing at the campus event, he finds Abby’s dead body in a stairwell at Diamond Hall. Although Kellan’s family and friends are all on the suspect list, he’s compelled to investigate once he learns about a mysterious donation to the college, a nasty blog denouncing his father, and fluctuating grades to allow the star baseball pitcher to play in the season opener. As Kellan settles back into his hometown and finds a second body on campus, his eccentric and trouble-making nana helps him weed through the clues. Is it the shady director of the athletic teams? A victim’s soon-to-be ex-husband? A player desperate to be noticed by an MLB scout? Kellan’s intent on solving the case just a smidge before the county sheriff, but that win might just put him in even more dangerous hot water. Readers discover a cozy, secluded Pennsylvania village full of quirky, charming, and nosy residents. Among the daily workings of Braxton College and the memorable Ayrwick family, Kellan weighs his investigative talents against an opportunity to achieve a much sought-after dream. Is he ready to move back home, take a job as a professor at the college, and re-unite with a former girlfriend? Or will he return to LA to raise his young daughter away from all the chaos? This entry was posted in My Blog and tagged author, book, Father Figure, free, newsletter.